With a $10 million TIGER grant from the US Department of Transportation, the Duluth Seaway Port Authority is embarking on an exciting new project along Duluth’s waterfront — undertaking a major adaptive re-use and redevelopment project on Garfield Pier (Dock C&D) that will not only re-establish the dock’s structural integrity, but also connect the 28-acre site to existing road access and rail infrastructure. Once complete, the new platform will markedly expand the port’s general cargo handling capacity. 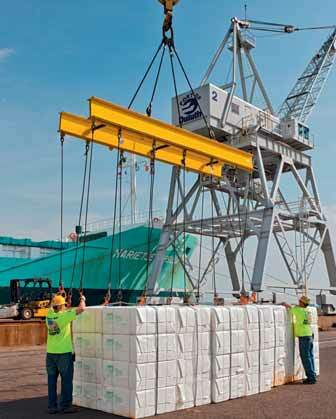 This redevelopment project represents a major undertaking for the Duluth Port. The total price tag is $16 million. In addition to the $10 million in federal funding awarded, project costs will be covered by nearly $3 million in funds forthcoming from the Minnesota Port Development Assistance Program with the balance committed by the Port Authority itself. making safety and security enhancements. Cargill donated Garfield Pier (Docks C&D) to the Duluth Seaway Port Authority in 1989; the Port Authority has since spent upwards of $3 million to demolish the old grain elevators and prepare the site for future capital upgrades. Located across the slip from the existing Clure Public Marine Terminal, the pier is currently used for the temporary storage and staging of wind turbine components and other project cargo. Transportation Investment Generating Economic Recovery (TIGER) grants date back to the program’s launch in 2008. Administered by the US Department of Transportation, it is the only general funding source for port-related and other transportation infrastructure projects across the nation, so this award represents a crucial investment in regional job creation, expansion of export capacity and overall economic competitiveness. There was nearly $474 million in TIGER discretionary funds available for 2013. Close to 1,000 ships visit the Port of Duluth-Superior each year, moving roughly 40 million tonnes of cargo including iron ore, coal, grain, limestone, cement and salt plus a variety of heavy-lift and project cargo. As the largest tonnage port on the Great Lakes-St. Lawrence Seaway, cargo movements through the Port of Duluth-Superior support 11,500 jobs and contribute over $1.5 billion to the local/regional economy. The Duluth Seaway Port Authority is an independent, public agency created by the Minnesota State Legislature to foster regional maritime commerce, promote trade development, facilitate industrial development and serve as an advocate for port interests here and around the world.